‘Tis the season for family reunions, holiday gatherings and — if you’re playing the role of host — nonstop cleaning and tidying up. This means all hands on deck, including the kids. And thanks to Dyson, now the kids can take on a bigger role: vacuuming. That’s right. Dyson now sells a tiny vacuum specifically made for children, and it’s oh-so-adorable. The best part is it’s incredibly affordable. For $30, this vacuum may be described as a “brilliant toy replica of the Dyson Ball,” but don’t be fooled. It actually works and will pick up small bits of paper and polystyrene balls. That’s it, but at least it’s something. 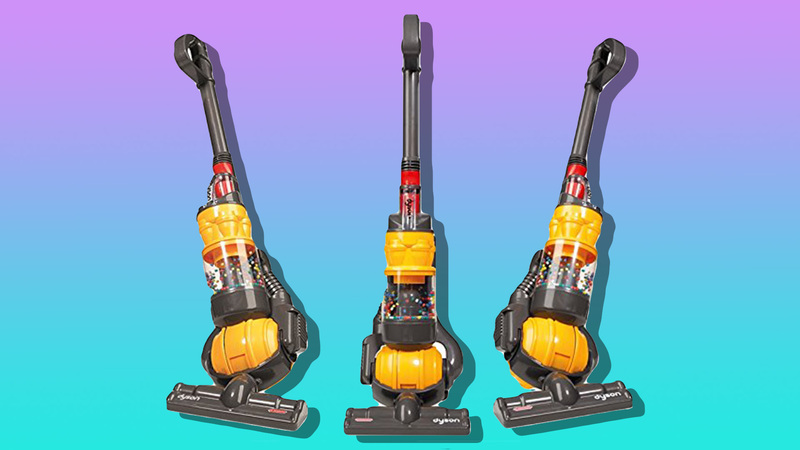 Plus, it has tiny colorful balls that bounce around in the clear casing, so at least it gives the impression vacuuming is actually fun. “Little ones adore role play and pretending that they are doing jobs around the house — just like the grown-ups,” the product description states. With realistic sounds and a removable dustbin to empty debris, this vacuum is suitable for kids ages 3 and up. It’s apparently worth every penny too: It has over 2,700 reviews and an overall rating of 4.1 stars on Amazon. Not only will this Dyson vacuum allow kids to take role-playing to a new level, but it’ll also help them develop essential life skills. Dyson’s got the right idea. Keep in mind this vacuum requires four C batteries to power it up, so be sure to add that to your Amazon basket when you go to purchase it. Because, really, how can you pass this up?